Need something extra for your race team or business? We offer silk screening on t-shirts. We also have access to over 1/2 million products, from some 3500 suppliers. 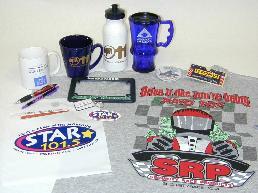 Sport bottles, mugs, key chains, lapel pins, buttons, temporary tattoos, and the list goes on. Most products require camera ready art work and we can help with that and orders are done in quantities and may have a set up fee. Please allow 3 weeks or more for production and shipping time.